How fun it is to roughhouse with a dog! They love it, are always willing and happy to oblige and both human and dog are up for a great time. Although men are generally more inclined to such playful activities, I’ve seen women and children also enjoy getting on the floor to wrestle with Fido. We push the dog around and Fido comes back mouthing, jumping and grappling with us. We roll around, we bear hug him, we grab his cheeks, we play tug-a-war, etc. It’s all fun, so what can possibly be wrong with it? Could roughhousing have any consequences on our dog’s behavior when we’re not playing around? A woman in her seventies once told me a story that I will never forget. She was taking care of her son’s dog while he was on vacation. All she had to do was go to his home a few times a day, feed the dog and let him out. The dog was a friendly 70 pound yellow lab named King. On her third visit, as she was heading towards the front door, she fell on the floor. King immediately pounced on her, tackled her and started mouthing her. She was clearly emotional as she was recalling how humiliating it was to be manhandled as such, even humped over and over. Due to her age, she wasn’t able to push the dog off and her ordeal lasted for close to 45 mins!! Why did the dog act in this way? She had figured it out right away. Her son’s favorite game with his dog was roughhousing. He would get on the floor with King and wrestle on a regular basis. From the dog’s perspective, a human getting down on the floor was his cue to play rough, and he did, regardless of whether or not the human in question was prepared and willing. Dogs chase, grab, push and sometimes play rough with other dogs. When dogs have all the right social skills, they have many ways to keep the situation under control. They stop and pause regularly, allowing for the excitement to go down and adapt to the size and strength of their playmate (self-handicap). Some dogs however play too rough, in a hyper-aroused state. Playtime with others takes the dogs to very high levels of energy, increasing the chances for things to turn bad. When we roughhouse with our dog, because we’re not dogs, we don’t master the rules of play and will often bring the excitement level out of control. Roughhousing with our dog is a personal choice. If we’re training for a specific task, in which speed of reaction and hard actions are needed, like in police work, playing with the dog this way could develop those needed drives. If we’re not, we have to fully understand what behaviors we are encouraging and what consequences could occur over time. Just like children, dogs need us to be consistent. If one moment we’re allowing jumping and mouthing, we can’t expect them to understand that just because we’re now wearing expensive work clothes, that behavior will no longer be tolerated. 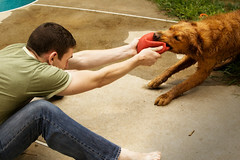 Certain movements that we make or things that we say, that are similar to those used during roughhousing could trigger rough responses from the dog. In my house, dogs learn to be gentle with people. When working with service animals, this type of play could have disastrous consequences for a person with limited mobility. We’re responsible for our dog’s behavior during their entire life. When a dog is allowed to play with humans like they would with rambunctious dogs, we take the chance that the dog may react in the same way with other people. We’re teaching the dog that humans are fun playmates to wrestle with and jump on. If we adopt the dog when we’re young adults, will it be OK for the dog to play this way when we have toddlers or when our friends visit with their children? Will our aging parents be able to keep the dog under control? The dog will not always know the difference and understand when it’s alright to play this way or when it’s not. Fido may also solicit attention for instance, by jumping or mouthing, behaviors that are rewarded during playtime. Put the behavior on cue and don’t encourage it when the dog initiates roughhousing without the cue. If you like your dog to jump on you, teach her that it’s OK to jump on you, only on you and when given a cue. Teach your dog to settle on cue. Keep your dog under close supervision when around other people, especially children, people with disabilities or of a certain age. Watch for signs that your dog is getting stressed and would rather get out of the situation (lip licking, turn away, trying to get away, etc.). Do not chase the dog around or you may have a hard time getting a hold of him in emergency situations. Don’t push the excitement level too high. Take short breaks and allow the dog to calm down on a regular basis. The video below shows a nice example of roughhousing that keeps the energy level under control and limits jumping and mouthing. There are many fun and dynamic ways to have a good time with our dogs, like playing fetch, that don’t encourage behaviors that are considered problematic in all other instances. The choice of roughhousing or not has to be taken wisely since it may have negative implications for the dog. Any behavior that has the potential to hurt a person can lead to injuries or lawsuits and the dog will pay the consequences. The question becomes: how important is it for us to roughhouse? Keeping everybody safe, the family, the visitors and the dog should always be the priority when making the decision to roughhouse or not. ‹ Dogs learn best with treats. What about horses? Great article, Jennifer. I was just talking to a client at work yesterday with a bulldog who kept biting us during a blood draw and the owner said he allows this on him during play! Fun for him, not so much for us. As a Certified Trainer Educator, I think the issue is’t whether you rough-house with your dog or not, but rather how the play is initiated and ended. Just like play with another dog, we can be the ones that control when a play session starts and ends. If you look at the communication between two dogs during a play session, there is always a beginning and end “signal”. It is the owner’s responsibility to teach this kind of polite play to their dogs should they decide to rough-house with them. Training can easily provide the best of both worlds. 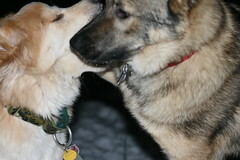 I tend to totally disallow ‘rough-housing’. It SO OFTEN leads to tears, fights and recriminations. It can lead to the rough-housing developing into real fights when two dogs are playing together whn one eants to “call uncle” and the other won’t accept that. And it can lead to the human either getting un-warrantedly angry with the dog for going over the unspoken human linmits, or the dog going over-threshhold when the human is not in tune with the dog’s degree of arousal. Thank you so much for posting the video. We’ve had our dog for almost a year now. We adopted him as a puppy. He’s getting to a point where he likes to try to tackle my boys. We’ve been working on it and he only engages in roughhousing when presented with a particular toy. Like a cue to play. The play stops when we get up and put the toy away. I didn’t see anything wrong with it until someone pointed out that I was encouraging him to bite. Seeing that video of evan and ripley, it was like a weight was lifted. It looked exactly like what happens in my house. Thank you again for explaining the consequences and showing the video. 2 Pings/Trackbacks for "Roughhousing with dogs, rules and consequences"